Let's rage...about the fact that we never got this. Theatrhythm Final Fantasy is one of my favorite Final Fantasy games. I frankly only really enjoy two or three games in the series, so the best part for me is the music. I can’t think of a single game in the series that doesn’t have at least a few fabulous tracks in varying styles. So to have an experience where I just sit back, enjoy the music, look at some nice graphics and hit some buttons to the beat was perfect. It is one of the only games I have ever actually purchased DLC for, which I generally keep a very strict policy on unless it provides major content. I think the only other time I bought DLC was for Bloodborne. That said, I was a bit more cautiously optimistic about Theatrhythm Dragon Quest. Not that the music by Koichi Sugiyama was any less wonderful, but I strongly associate it with the main series for the reason that Dragon Quest is so utterly consistent from game to game. I can’t imagine a DQ game without it. 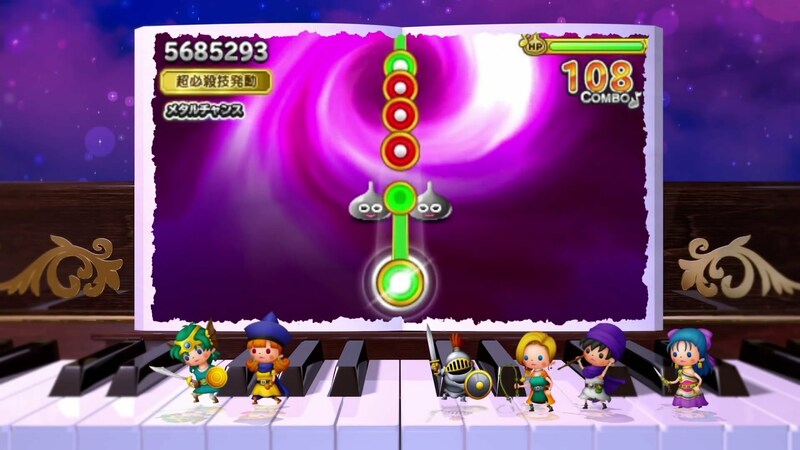 Once I got into it, the magic of Theatrhythm Final Fantasy returned immediately, albeit with a brand new musical flavor. The Dragon Quest compositions worked exactly as well as I had hoped for with a few cool differences in the mix for good measure. 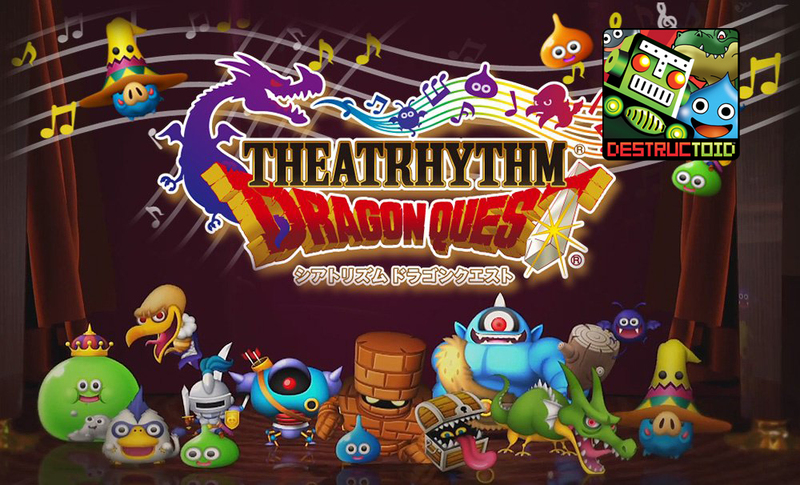 Theatrhythm Dragon Quest is essentially split into two primary types of songs; field and battle. 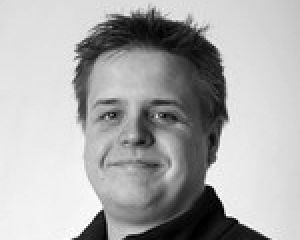 As the field songs are generally of a more relaxed pace, comprised of town and world map music and therefore not as frantic, much of the challenge comes in guiding your stylus or analog stick along a trail of notes moving in from the left-hand side of the top screen which need to be “held” in conjunction with timing taps or button presses to hit other notes in a sequence in more rapid succession. In the background, your chosen characters will walk across a field, castle, or other location. The more accurate your timing, the better grade you will receive at the end of the stage. Battle songs are more fast paced and descend down the screen, the background being preoccupied with a first person battle animation featuring various monsters from the Dragon Quest series, and you cutting them down as you play successfully, with your party performing special moves if their performance is solid during key parts. You even get metal slimes in the mix which require better timing, or they will simply run away. No DQ game is safe from the elusive metal slime apparently. It’s a little hard to explain, but what you get is similar to many other rhythm games such as Elite Beat Agents or Project DIVA, but split into two distinct styles. Personally, I find the battle songs more interesting and usually more challenging, especially when played on higher difficulties, but differentiating their styles helps a bit in encouraging players to experience both. There is a basic campaign mode where you can move through the games songs in an order according to the title in the series they are from, and this encompasses the first ten Dragon Quest games. That's 65 songs in all, not including DLC songs, which I did not look further into. In addition that that, you also get a mode featuring the Sugoroku style board game from the Dragon Quest casino to add a little more replayability. The long and short of the game is playing songs to get higher rankings, which will allow you to accumulate experience points and earn new party members to your roster from throughout all the different games. It would have been nice to get this one here if only to give us a taste of the wonderful soundtrack from Dragon Quest X, but with the series already languishing in pseudo-obscurity, it is no surprise that it was held back. It’s funny to think that Sugiyama’s music, which is so beautiful timeless and memorable, became such an important part of the Dragon Quest series. And it all started when Sugiyama sent a letter to Enix asking to compose the music for their upcoming Famicom RPG. Now the game is a phenomenon, and while there are many spinoff Dragon Quest games that did come here, this one didn’t, and it’s a shame. It is a fun little pick up and play title, and I am happy to own an import 3DS just to be able to spend time with some of the best music in gaming history.